Welcome to the new Tracey’s Culinary Adventures! I am thrilled to share it with you! I’ve been wanting to give the site a facelift for years, but just haven’t been quite brave enough to pull the trigger. Finally, I turned to Melissa and Erin, the lovely ladies from Wooden Spoons Kitchen, to make this dream a reality. From branding and a new logo to a complete redesign of the site (including a long overdue move from Blogger to WordPress), they worked their magic and put up with my crazy along the way 🙂 I couldn’t be more pleased with the result! You guys have been begging me for a recipe index for years so I’m definitely most excited to introduce you to the recipe page. With over 1500 posts on the site, this new visual index should make it a lot easier to find what you’re looking for. It’s going to take me some time to get through the archives and categorize everything so consider this a work in progress but a huge step forward nonetheless! You’ll also find a new search function in the top left corner of the site. I know the one on the old blog wasn’t terribly useful; I think you’ll have a lot more luck now. 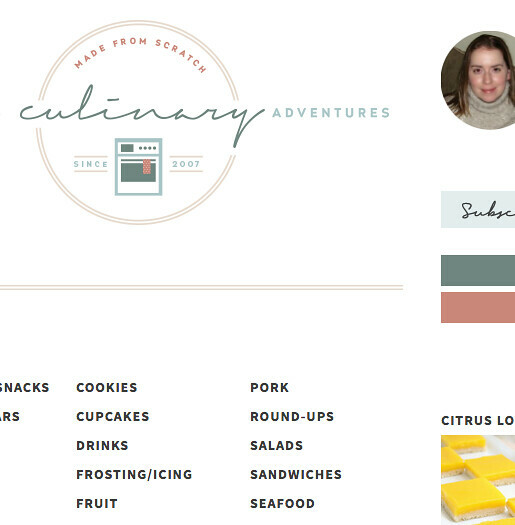 26 Responses to "A Makeover for Tracey’s Culinary Adventures!" Just a quick thank you. Out of the myriad of food blogs I follow you are tied for first with most recipes made, and first in most recipes enjoyed. Keep up the good work. The new design is beautiful. Love the new look and feel! Isn’t it a great feeling to refresh your blog like that? I held off way too long myself. Love the new look Tracey! I love it so SO much! It looks so fantastic!! WAHOO!!! Such a fabulous design!! And it’s way easier to comment now! I love the new layout! You are my favorite food blogger and I just wanted to say thanks for all your hard work! I LOVE it, Tracey! It’s so classy! I’m so happy for you!! Hooray! It looks fantastic, Tracey. Congratulations. And I’m so happy you’re back online so I can print out that oatmeal cookie recipe to make this weekend 🙂 Hope you feel better soon. Congratulations on the new design!! It looks fabulous!! BTW, OMG, I love that there’s a section for “Shane’s Favorites”!! So cute!!! LOVING the new site, Tracey!! So clean and gorgeous!! I LOVE the polka dotted background, so incredibly cute. Congrats on the beautiful, positive blog upgrade! Standing ovation Tracey ! I read your blog almost everyday though I only commented once, and I secretly hoped something like this would happen. It looks clearer and it will be easy to browse for a recipe now! Thank you for those good recipes that always bring me compliments, and thank you for improving the layout for us ! Love the new site Tracey – it is gorgeous, and very user friendly! I am in Albuquerque New Mexico and just love your site–your cookie recipes are so good . It is fun to hear about all the snow in RI because here we have had none. Thanks for your site and I am so excited about the recipe index! LOVE the new design! Great job! LOVE IT LOVE IT LOVE IT!!! I am SO happy you went through with it. Looks amazing. Congratulations on the new design, Tracey, it’s awesome! Feel better soon!! I love it! Sleek, pretty and classic all in one.